Terrorism was the main theme of the fifth annual Moscow Conference on International Security, hosted by Russia’s Defense Ministry, April 27-28, 2016. Tensions between Russia and the United States have escalated over the conflicts in Syria and Ukraine, but there were signs at an international security conference in Moscow this month that the Kremlin may be softening its tone toward the West. The fifth annual Moscow Conference on International Security, hosted by Russia’s Defense Ministry April 27-28, included top military officials from more than 80 countries, as well as influential Russians seen as barometers of the Kremlin's attitude. Kremlin Security Council Secretary Nikolai Patrushev speaks at an international security conference in Moscow, Russia, April 27, 2016. 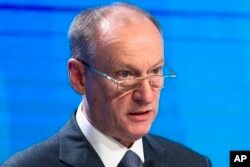 For example, the secretary of the Kremlin’s Security Council, Nikolai Patrushev, who previously headed the Federal Security Service, Russia’s main security agency, has frequently given speeches at various forums condemning what he describes as the United States' "hostile" policy toward Russia. At the Moscow conference, however, he conveyed greetings from President Vladimir Putin that included uncharacteristically benevolent words about the U.S.
"Cooperation between Russia and the U.S. on Syria is a clear example of the fact that such cooperation is not only possible, but effective,” Patrushev said. Russian Defense Minister Sergei Shoigu speaks at an international security conference in Moscow, April 27, 2016. Terrorism was the theme of the annual conference held in the Russian capital over two days. 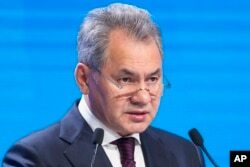 Shoigu even spoke rather benignly about NATO, stating, "We prefer to communicate with the alliance at the negotiating table, not through gun sights." However, perhaps the most interesting signal that Moscow would like to reduce tensions with the West, and even cooperate in matters of security, came from a man many observers see as a kind of negotiator between the West and Russia on sensitive matters: Alexander Rahr, a well-known German political analyst who advises Gazprom, Russia’s giant state-controlled natural gas monopoly. Rahr is a member of the Valdai Discussion Club, a forum at which political analysts and journalists from around the world have been meeting with Putin annually since the earliest days of his presidency. At the end of 2013, Rahr took part in negotiations for the release from prison of Mikhail Khodorkovsky, the former oil tycoon who became a Putin foe. Rahr said at the security conference that "Russia is committed to cooperation with the West, not as an underling to liberal values, but based on pragmatic interests, including economic ones." He said in order to "limit the magnitude" of the "conflict of values" between the two sides, a new "Charter of Paris" should be signed on the basis of a new “Helsinki” process. Rahr was referring to the charter signed in 1990 by European governments, the United States and the Soviet Union, on the basis of the Helsinki Accords, which were signed 15 years earlier in an attempt to reduce tensions between the Soviet bloc and the West. According to some observers, given Rahr’s close connections to the Kremlin, his comments most likely reflect the views of those in power in Moscow. Military expert Alexander Golts, a visiting scholar at Sweden’s Uppsala University, believes Russia is seeking from the West what the Soviet Union sought nearly a half century ago. The Kremlin’s current leaders, said Golts, want the West to abandon any attempts to foster a “color revolution” in Russia, like those that took place in Ukraine and Georgia. According to Golts, the Russian proposal to "peacefully coexist" with the West comes with another condition, besides noninterference in Russia’s internal affairs. 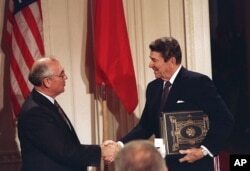 FILE - President Ronald Reagan, right, shakes hands with Soviet leader Mikhail Gorbachev after the two leaders signed the Intermediate Range Nuclear Forces Treaty, Dec. 8, 1987. Still, Russia will maintain some level of tension with the West for domestic political reasons, Golts said, adding that in this regard, there are significant differences with the Soviet period. “It is obvious that Moscow doesn't have the kind of resources for waging a Cold War that were available to the Soviet Union,” he said. “[It has] no allies — in fact, the economy is very dependent on the outside world. [It has] an aging population, from which a vast army cannot be created. And, in this sense, the situation is rather more risky, because out of its old resources, the only [ones] that remain are its nuclear weapons. "I believe that the Kremlin’s policy will become increasingly dangerous precisely in the nuclear field. The Kremlin will need to translate its gigantic nuclear arsenal into political potential." Thus, despite the benign tone of Russian official comments at the security conference, tensions between Russia and the West will increase. "This means that the West will more and more move toward military containment of Russia, to something resembling the policy of [U.S. President Ronald] Reagan,” he said. “It makes the situation more dangerous: We are moving toward an increasing military confrontation." Andrei Soldatov, an expert on Russia’s security services and author of The New Nobility: The Restoration of Russia's Security State and the Enduring Legacy of the KGB, also noted that Russian officials at the conference sounded much less hostile toward the United States than in previous years. "The rhetoric was really considerably softened compared to last year,” he said. “Last year, the U.S. was directly referred to as the main ‘bad guy’; this time, they simply referred to ‘some countries.’ And when the United States was mentioned, it was called a partner, with which [Russia] has good relations in the anti-terrorism area, and that it would be a good thing to expand [these relations]." 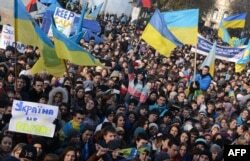 Students hold placards and flags as thousands rally in the western Ukrainian city of Lviv during a rally of pro-European supporters, Nov. 27, 2013. However, such signals are directed exclusively at the outside world, Soldatov said, adding that inside Russia, the West continues to be portrayed as the place from which the threat of "color revolutions" emanates. "There is a narrative that is intended for the domestic audience, and another for external use only,” he said. “Inside the country, they need to make clear statements about how … the country is surrounded by enemies, but this narrative is not intended for practical use in the outside world — for example, in negotiations with the Americans. "The Americans, by contrast, are clearly given to understand that Syria is the now the issue that can improve relations, and this is even being said by people from the Russian security services. But both narratives are simply rhetoric to achieve specific goals."